Dog ramps are an underrated essential that can make life so much easier for owners of dogs with special needs, or simply dogs who are elderly. 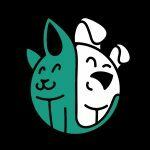 Using a dog ramp to help your pet reach those tougher, elevated or depressed places can mean the difference between your dog coming with you on trips out or not, going to the hydro-pool to stretch their legs or not- in short, a pet ramp can make it easier for you to ensure that your pet gets the most out of life. Even if you’re dog doesn’t struggle, having a ramp for dogs makes travelling with larger dogs safer and more comfortable (we definitely don’t want you throwing your back out!). The best dog ramps are convenient, easy to use, totally safe for long-term and short-term use, and portable. So, we’ve compiled a list of the best, portable and/or folding dog ramps available today. Whether you’re looking for a dog ramp for your car or a pool pet ramp, read on to find the best pet ramp for your needs. Our top choice in dog ramps is the Solvit Ultralite, which simply folds in half and weighs just 10lbs. This is a great option for those looking for a ramp that’s able to fit into any space and be used anywhere, whether you’re looking for a pool dog ramp or simply want a dog ramp for bed time. It uses rubber footing on the bottom to help keep the dog car ramp in place, when in use and raised side lines that help keep your dog on track for their goal. It also has a surface that helps increase traction, which is why this is such a great option for dogs who need help getting to and from wet surfaces. If you live an area that’s prone to rainy weather or like to take your dog to the local pool or pond, this is a great option. The PetSTEP option is a slightly pricier version that has a steeper incline than our No.1 option, however this works for smaller spaces. So, if your dog needs a helping hand getting into bed or you just need this dog car ramp from time to time, this should be your first option. It takes up less storage space too, since it’s a shorter item, so great for bringing with you on long trips. The surface of this pet ramp is rubberized, so it’s great for traction and can hold up to 500lbs, although this is similarly compromised with a heavier ramp, weighing in at 18lbs. This is the perfect dog ramp for occasional use, such as weekly trips to the pool. This freestanding ramp from Pet Gear is perfect for pets that like to sleep on the bed. It’s also great if you’re looking for a dog ramp for trucks or a dog ramp for SUV’s, as the usually higher seating positions can be easily reached with the help of the freestanding ramp for pets. It’s also perfect for any area that doesn’t have the space for grips, which you would need for some of our other options. Of course, this in turn comes with some set-backs. 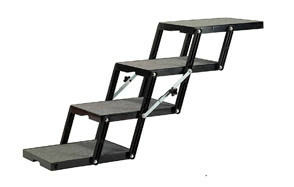 This freestanding ramp isn’t adjustable and not so portable, so can’t be used freely for a multitude of reasons- you’ll only get the one height and it’s not likely to fit everywhere you need it to be. Still, this is great for the home, if your pet is struggling to get to their favourite places. The Gen7Pets ramp comes with a pleasing grass-like design that helps provide extra grip for your dog. Portable and relatively lightweight, this easily slips into the smaller spaces of your vehicle and can flip open to its full length, in one, quick motion. Despite it’s small stature, this dog ramp can hold up to 250lbs, come with an ergonomic handle and can also be attached to your car with a fabric clasp, ideal for your dog’s safety. The Titan telescopic pet ramp works in the same way as a telescopic ladder, in that it easily collapses in on itself, while remaining sturdy enough to hold up to 180lbs, which makes it great for most dogs. The aluminium materials made it ideal for travel, as it remains lightweight at 13lbs, although this shouldn’t be used in water without being thoroughly dried between uses, which can be difficult due to it’s design. 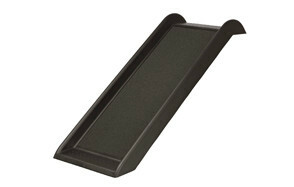 Another option from Solvit that is perfect for those dog owners who are looking for a pet ramp for their SUV. This extra-long offering comes in a telescopic capacity- again, great for travel and perfect for larger or higher vehicles. It’s also perfect for even the largest dog, as it holds up to 300lbs. Again, this is made with a combination of aluminium and plastics, so isn’t ideal for water-based activities, although it would be easier to dry due to the way the ramp closes. The Paws and Pals plastic dog ramp is a cheap and cheerful alternative to some of the pricier units for sale- but that doesn’t mean it has compromised on quality. While some of the reviews mention needing to oil the hinges on this purchase, in order to have the pet ramp open smoothly, overall the reaction to this item seems very positive. This is a simple, easy to use and easy to store dog ramp that comes with grip stickers, if your dog is prone to slipping, or if you’d like to use the ramp in, or near, water. If you’re looking for stairs for your pet, as opposed to a ramp but still want your assistance to be flexible and portable, this is a fantastic option. It’s also a fantastic entrance to some SUV’s or larger vehicles, as the adjustable nature and steps allows for better grip to larger heights. The Pet Loader platform is slightly more expensive than others but has been designed for dog safety as a priority. The engineers here have prioritized the natural gait of dogs, making this one of the most comfortable steps for your pet to use. Our ninth option is provided by Trixie, and is a simple, easy to use item that requires no movement whatsoever, to get your ramp set up. It is also the lightest option on our list, with a shipping weight of just 7.6lbs. Unfortunately, it does lack in any adjustability as the ramp is fixed and consistently open. If you’re looking for help for your dog around this house, this is ideal- but it’s probably not going to be great for any outdoor activities. Our final choice is a durable, heavy-duty ramp that will work perfectly for lower areas. If your dog has a handicap, or is struggling with something specific, this would be a great addition to the home, to help your pup reach their bed or sofa. That said, some reviewers note that the length is too short for the highest selection. It’s also not the best for travelling with, but many note that is a great option for smaller dogs who struggle to get around. Will you be using a ramp for my dog in any wet areas? This is especially necessary for disabled dogs, who may need to undergo hydrotherapy. Since this is a huge part of their physio and can be a great way for dogs to still get their exercise without aggravating their arthritis or injuries, you know you’ll need an accessible ramp that allows your pet to take part in these activities. It might also be the case that you simply enjoy taking your dog to local pond but notice that they aren’t so keep at jumping in the water. Some ramps are designed for this and come with extra traction which allows your pup to easily go into and come out of the water, without slipping or risking injury to themselves. Do you need a portable ramp? If your dog comes with you on a day-to-day basis, for any reason such as you both enjoy your long, daily walks, or they come with you to work, you’ll need a pet ramp that is easy to transport, too. As above, you’ll also need a portable ramp if you’re taking your dog to any pools or ponds. Whatever the reason is, you’ll need a ramp that is easy to use- but also stays out of the way when not in use. A lot of the options we’ve chosen, above, can be folded down in some way or other, which makes them great to bring along on these trips. Do you need an adjustable ramp? If you’re dog is poorly and struggles with their jumping or walking, it’s likely you’ll be using this ramp a lot. In which case, you’ll need a pet ramp that works well on all surfaces, since they’ll need this option to get into bed, on the couch, into the car or into their hydrotherapy pool. Choose a dog ramp that has good grip, both on it’s surface and underneath, so it can easily grip onto whatever surface you wish your dog to go to. We’ve given a good range of different types in our list- but you’ll need to bear in mind that your ramp needs to be appropriate for the surfaces it will be against. It’s always a good idea to get a ramp with great grip, such as rubber grips, to ensure it doesn’t come loose as your dog uses it. However, the main material will also need to be compatible with your lifestyle. 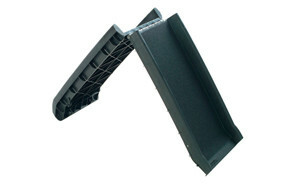 If you need your ramp to be lightweight, plastics will usually fare better. If you need a waterproof ramp then plastic, again, should be your preferred material. However, if you’re looking for something a little more heavy-duty, you should opt for a steel or aluminium ramp that is likely to hold more and stay firm, while being less likely to become damaged. An important factor when looking into your new dog ramp is to consider the weight of your dog. Cheaper, less well-made items won’t hold up under larger dogs, which can be dangerous. So be sure to check the maximum weight when considering your new ramp and check your dog’s weight to see if the two are compatible. Dog ramps are great for a number of reasons- but, without a doubt, it seems to be that the number one reason people will search for dog ramps is down to the fact that older dogs simply aren’t as nimble as they used to be. A dog ramp will help your canine companion get from A-to-B without causing themselves any harm. It allows them to continue living their life, without the hindrance of working around your dog’s accessibility. Most importantly, it will keep them comfortable should they have arthritis, ligament or musculo-skeletal pain. It’s also really handy to have a pet ramp around for smaller dogs. Dachshunds, Pugs, Pomeranians and more many small dog breeds can easily struggle with large gaps between surfaces and having a good pet ramp around the house will save you a lot of bending and picking up- not to mention it gives your dog a little extra independence, as they won’t need to wait for their human to be nearby in order to get comfortable. While each dog ramp will vary in style and material, the two main differences between the ramp is whether they are adjustability and portability. In terms of adjustability, an adjustable dog ramp is great for the variety of landscapes your dog may need assistance with over time. Some ramps are adjustable in their length, such as the telescope ramps mentioned above, while others can have their height adjusted. Meanwhile, fixed ramps will usually come in one length, with grips on either side for stability. This is great for more permanent usage but can be a pain for those who need a little flexibility in their dog ramp usage. Speaking of multiple uses, another type of ramp comes down the portability. Some ramps are simply too big to take around with you and can be quite heavy. These will usually come with the idea that they stay in one particular spot for the majority of its lifetime. On the other hand, portable dog ramps are easier to bring out and about, often coming with handles for travel and either breaking down into smaller pieces, or simply being set up for use. If you decide to use one of the more portable items, you’ll need to have a play and get yourself used to how it breaks down and builds back up, to save for any pinched skin and wasted time, while your dog happily bounds about, excited for their car trip. Q: What is a dog ramp? A: A dog ramp is a bit of kit your dog can use to ascend or descend from one surface to another. They’re ideal for helping get your pet into the car, onto the bed or any different height that causes them to usually struggle- especially if they’re injured or struggle with jumping from one area to another. They’re also used in training, either for recreational use (such as dogs beginning their agility training) or for more professional uses. An example of the latter would be how pet ramps are used during guide dog training. Indeed, a standard test for beginner guide dogs is how well and comfortably they can cross a dog ramp- if a pup has no issue and doesn’t resist the change in texture, height etc. they can then be considered for further training. Q: How do I know if a dog ramp is safe for my dog? A: All quality dog ramps should be certified for use in America. As long as your pet ramp is used solely for the purpose it was intended- in that only pets can use it and those pets are under the recommended weight for their pet ramp- they can actually increase the safety of your dog. Especially as injured dogs can easily cause further injuries if they try to jump back into being excessively active, too soon after an injury. Remember to follow all the instructions given, properly. Try to familiarize yourself and your dog with the dog ramp before diving right in and using your new purchase and be sure to always use the ramp for the right reasons, securing your ramp properly and keeping an eye on your pet while in use. A: Absolutely! While not all pet ramps are suited for use in water, you can easily pick a dog ramp that is designed for this. The majority of options given above have this ability, and we’ve made a note of those which don’t, for you. The main things to look out for when using your dog ramp with your pool, is to check that there is enough traction available, so your pup isn’t likely to slip and fall during use. You should also ensure that the grips at the bottom of the ramp will hold against the edge of pool and the bottom of the pool itself. Finally, ensure that the materials are suitable for use with water- in this case, you will usually find that the plastic varieties are best for wet- and dry- use. With all the considerations we’ve discussed above, it’s hard not to see why we chose the Solvit bi-fold pet ramp. Being so easy to maintain, carry, fold and use, this is one of the best pet ramp products on the market and is so easy to use. With over 1,000 happy customers and seemingly endless 5-star reviews, you know it’s loved by users and their canine companions. Not to mention that the price is pretty reasonable and the added safety features, and it’s clear to see why so many people love it!